The index opened flat to negative and stayed negative for major part of the day only to see some short covering rally around the last hour but closed in red at 8797.40, small loss of 11.50 points. The broader market was positive, with 879 advances to 630 declines. Developing Range as per Option Table comes to 8500-9000. Call option 8800-9300 added huge 15.98 lacs OI with small short covering seen at 8600 and lower strike prices. 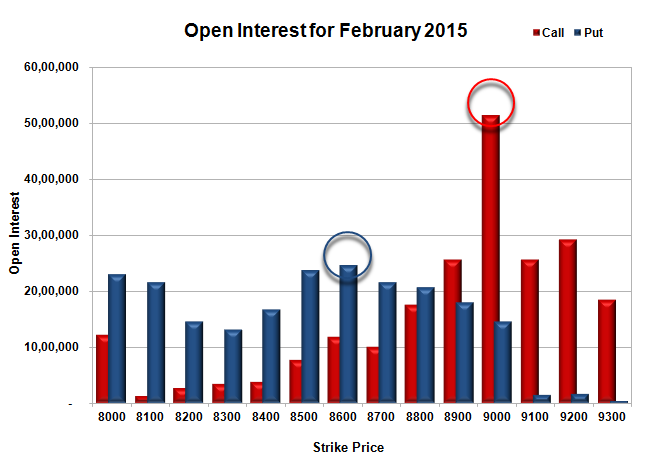 Put option 8700-8600, 8100 added huge 9.24 lacs OI with short covering seen at 8800 and above strike prices. 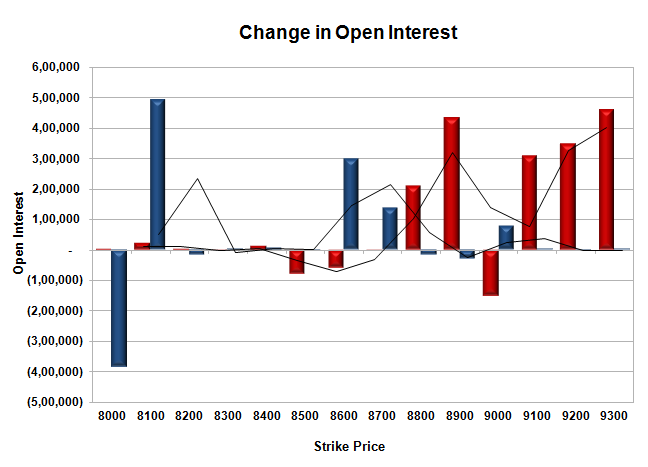 Nifty Open Interest is at 2,49,68,800 down by 5,36,175, with small decrease in price, most probably long liquidation. Bank Nifty Open Interest is at 22,83,375 up by 2,54,525, with increase in price, most probably huge long build-up. FII’s sold 1.26 lacs Futures, which includes 11939 contracts long liquidation and 6898 contracts short covering, with decrease in net OI by 18837 contracts (includes 59549 longs to 64590 shorts for the day) and the Average Price comes to 9022.58. FII’s Index future open contract as on date is 834586 Longs to 100537 Shorts, net long 734049 down by 5041 contracts. Initial support looking weak but still at 8800, with OI of 20.74 lacs and below that at 8500 with OI of 24.62 lacs. Initial resistance at 8900, with OI of 25.63 lacs and above that at 9000 with highest OI of 51.37 lacs. 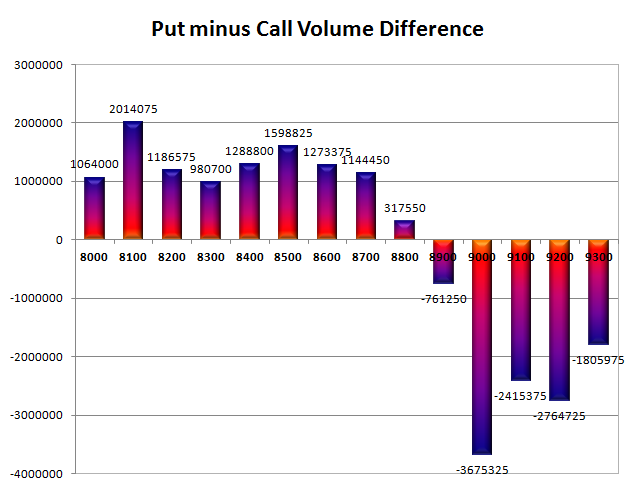 Day Range as per Option Table is 8713 - 8882 and as per VIX is 8703 - 8891 with 8796 as the Pivot.